A very easy, had-everything-in-the-house, kind of meal! Mix the tamari and the apple juice together. Slice the tempeh in half and then half again. Then slice it in half again, so that it is half as thick, and finally, cut into triangles. 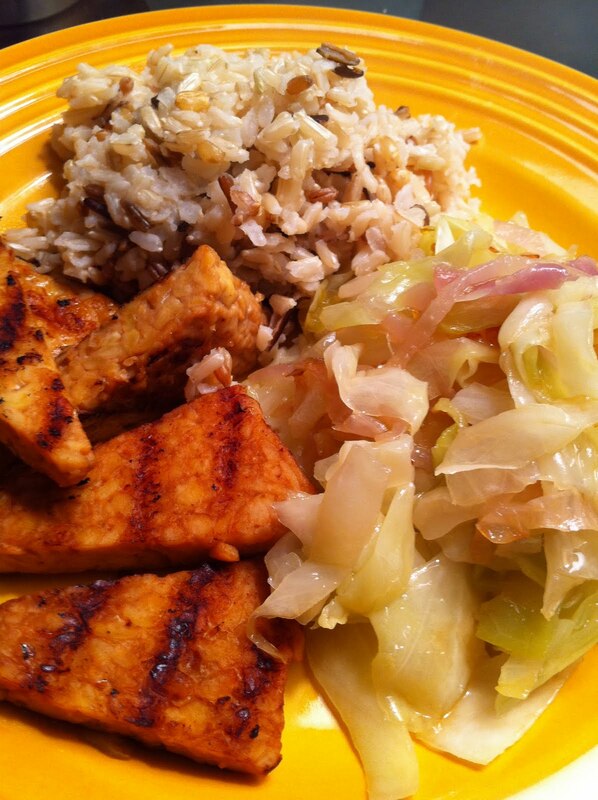 Marinate to soften the tempeh and give it time to absorb the flavor of the marinade. The wild rice I use takes 45 minutes to cook so start this up right away. When the rice is done, let it sit for about 5 minutes. In the meantime, brush a grill pan with safflower oil, heat it up, and grill the tempeh until there are nice grill marks on the first side (2 to 3 minutes). Turn it over and get grill marks on the other side.